Farm storage sheds are replacing silos as the preferred choice for storing crops in the Perth area and across WA. As profit margins become slimmer and slimmer for many farmers, it is important to maximise every crop. One of the best ways to do this is to make sure that the storage medium is perfect for your crops. That way, you can ensure less spoilage and higher quality, which can fetch a higher price at the market. For years, most farmers used silos for crops such as wheat. In an era when weather was more consistent and the market wasn’t as competitive, that worked out great for most farmers. However, Australia’s climate has become more extreme, increasing the risk of crops stored in silos to suffer spoilage. In rare cases, farmers have reported total loss of crops in silos due to weather extremes. Luckily, there is a solution: farm storage sheds. A modern, well-designed and well-built shed provides more protection for your crops. Our high quality Bluescope Steel sheds provide more insulation and more ventilation than a traditional silo does. This allows your crops to get all of the air they need and provides them a more consistent environment. Temperatures don’t go as high or as low as in a silo. In addition, adequate ventilation helps control the humidity, decreasing the risk of microorganisms infecting your valuable crops. The process is easy. First, you call us for a consultation. Then, we design a custom solution for you based on factors such as your wind region, your terrain category and your topography factor. These all go into determining your wind speed and your shed is built within ShedSafe specifications to ensure that it will provide you years of service. The end result is a shed that is safe, sound and functional. It provides the best protection for your crops. 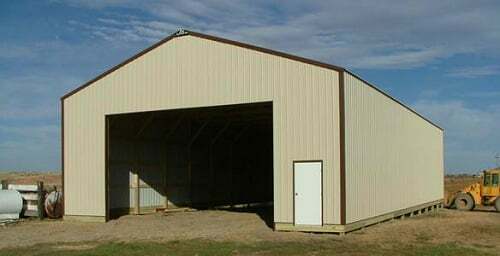 We also provide barns, hay sheds and machinery sheds. Call 1300 778 628 to learn more.